Made available in DSpace on 2015-07-24T13:00:30Z (GMT). SUNY Oswego Creative & Scholarly Works Faculty Donated Material Nov. 1, 2002 Oct. 31, 2003 Arranged by Faculty Name & Date Donated Andrews, David [Economics] Oct. 2003 Commodity Fetishism as a form of life: language and value in Wittgenstein and Marx. Marx and Wittgenstein: Knowledge, Morality and Politics Ed. Gavin Kitching and Nigel Pleasants. London: Routledge, 2002. 7894. Baloglou, George [Mathematics] Oct. 2003 _____ and Nick Nicholas, Trans. & Commentary. An Entertaining Tale of Quadrupeds New York: Columbia U.P., 2003. Brady, Ivan [Anthropology] March 2003 The Time of Darwins Reef: Poetic Explorations in Anthropology and History Walnut Creek, CA: Alta Mira Press, 2003. May 2003 [Rev. of] Cannibalism and the Colonial World, ed. by Frances Barker et al. Journal of the Royal Anthropological Institute 8.4 (2002): 767768. Card, Robert F. [Philosophy] April 2003 Using Case Studies to Develop Critical Thinking Skills in Ethics Courses. Teaching Ethics 3.1 (2002): 1927. Casey, Jean [Counseling & Psychological Services] Oct. 2003 _____ and Gerald J. Solan. Police Work Addiction. The FBI Law Enforcement Bulletin June 2003: 1317. SUNY Oswego Scholarly & Creative Works Page 2 of 13 Penfield Library, SUNY Oswego 20022003 Chambers, Jean E. [Philosophy] April 2003 Responses and Dialogue: Response to Clone Alone by Carson Strong and Are There Limits to the Use of Reproductive Cloning by Timothy Murphy. Cambridge Quarterly of Healthcare Ethics 11 (2002): 169179. Oct. 2003 Ethicists as Architects: Revising Moral Theory Using All the Tools. Philosophy in the Contemporary World 9.1 (2002) 2737. Chaudhari, Ram [Physics, Emeritus] April 2003 Editor. Vigyan Prakash: A Science Magaz ine published by World Hindi Foundation 1.1 (2003). April 2003 Editorial. Hindi Jagat 3.3 (2002): 2. April 2003 Editorial. Hindi Jagat 3.4 (2002): 2. April 2003 Problems in the Development of Hindi. Hindi Jaget 3.4 (2002): 36. April 2003 Editorial. Hindi Jaget 4.1 (2003): 1. Oct. 2003 Editor. Vigyan Prakash 1.3 (2003) Oct. 2003 Development of Science: A Historical Perspective Part III. Vigyan Prakash 1.3 (2003): 1832. [In Hindi] Oct. 2003 Editorial and Development of Science A Historical Perspective, Pt. II. Vigan Prakash: A Science Magazine Published by World Hindi Foundation 1.2 (2003): 2432. Oct. 2003 Tradition of World Hindi Convention. Hindi Jagat 4.2 (2003): 23. Oct. 2003 Challenges to Hindi in the Twenty First Century. Hindi Jagat 4.4 (2003): 2. Oct. 2003 Editorial : Usefulness of Hindi. Hindi Jaget 4.4 (2003): 2. SUNY Oswego Scholarly & Creative Works Page 5 of 13 Penfield Library, SUNY Oswego 20022003 Helfgott, Michel [Mathematics] Nov. 2002 Historia y Pedagogia de la Matemtica. Lima, Peru: Instituto de Matemtica y Ciencias Al fines, IMCA, 2001. Kulikowski, Mark [History] Oct. 2003 The Tradition Continues: Russian Emigr Bibliography Since 1917. SOLANUS: International Journal for Russian & East European Bibliographic, Library & Publishing Studies NS 17 (2003): 5057. Kumar, Alok [Physics] Oct. 2003 Laboratory Manual for College Physics I (PHY 111 and PHY 112). n.p. : Wiley Custom Services [printer], 2004. Oct. 2003 _____ and A.W. Joshi. What Can We Learn From the Electromagnetic Spectrum? Resonance 8.3 (2003): 825. Kurst Swanger, Karel [Public Justice] March 2003 _____and Jacqueline L. Petcosky. Violence in the Home : Multidisciplinary Perspectives NY: Oxford U.P., 2003. La Manna, Juan [Music] April 2003 _____Pianist, Kelly J. Covert, Flautist, and Elizabeth A. La Ma nna, Cellist. Chamber Music Concert, Feb. 14, 2003. Tyler Hall, SUNY College at Oswego, Oswego, NY. SUNY Oswego Scholarly & Creative Works Page 6 of 13 Penfield Library, SUNY Oswego 20022003 April 2003 _____ Pianist, and Russell Guyver, Violist. An Evening of Chamber Music, March 12, 2003. The Fulton Music Assoc., All Saints Church, F ulton, NY. April 2003 _____Pianist, and Russell Guyver, Violist. [concert] Church of the Resurrection, March 13, 2003. April 2003 _____ Pianist, and Russell Guyver, Violist, in Concert. Amnesty International, Ridotto del Teatro dellUnione Viterbo, 16 March 2003. Loe, Mary [Library] April 2003 [Rev. of] Critical Survey of Poetry 2nd ed., by Frank N. Magill and Philip K. Jason. Choice March 2003. ChoiceReviews.online 15 May 2003< http://www.choicereviews.org April 2003 [Rev. of] Columbia Grangers Index to Poetry in Anthologies 12th ed., ed. by Tessa Kale. Choice Oct. 2002. Choice Reviews.online 15 May 2003< http://www.choicere views.org April 2003 [Rev. of] Mighty Fine Words and Smashing Expressions: Making Sense of Transatlantic English by Orin Hargraves. Choice May 2003. ChoiceReviews.online 15 May 2003< http://www.choicereview s.org Lonky, Edward [Psychology] See James Pagano October 2003 See Paul Stewart Sept. 2003 Loveridge Sonbonmatsu, Joan [Communication Studies, Emerita] Feb. 2003 Winged Odyssey : Poems and Stories Syracuse, NY: Hale Mary Press, 2002. SUNY Oswego Scholarly & Creative Works Page 7 of 13 Penfield Library, SUNY Oswego 20022003 Markert, Linda Rae [School of Education] Feb. 2003 And the Beat Goes On: Diversity Reconsidered. Initiatives in Technology Education: Comparative Perspectives. Technical Foundation of America and Centre for Technology Education Research, Griffith University, 2003. 262271. McCune, Mary [History & Womens Studies] March 2003 Creating a Place for Women in a Socialist Brotherhood: Class and Gender Politics in the Workmens Circle, 18921930. Feminist Studies 28.3 (2002): 585610. Messere, Fritz [Communication Studies] Oct. 2003 _____, Carl Hausman, Philip Benoit, and Lewis ODonnell. Announcing: Broadcast Community Today 5th ed. Belmont, CA: Thompson/Wadsworth, 2004. Oct. 2003 _____, Joseph R. Dominick a nd Barry L. Sherman, Broadcasting, Cable, the Internet, and Beyond: An Introduction to Modern Electronic Media. 5th ed. Boston: McGraw Hill, 2004. Oct. 2003 _____, Carl Hausman, Philip Benoit, and Lewis ODonnell. Modern Radio Production. 6th ed. Belmont, CA: Thompson/Wadsworth, 2004. Nanthakumar, Ampalavanar [Mathematics] Oct. 2003 _____ and K. Selvavel. On FixedWidth Estimation of Process Capability Index. American Journal of Mathematical and Management Sciences 23.1&2 (2003): 93 108. SUNY Oswego Scholarly & Creative Works Page 8 of 13 Penfield Library, SUNY Oswego 20022003 Nichols, James [Library] Oct. 2003 ________, Barbara Shaffer, and Karen Shockey. Changing the face of Instruction: Is Online or Inclass More Effective ? College & Research Libraries 64.5 (Sept. 2003): 378388. Ouellette, Anthony [Biology] Sept. 2003 _____, Lorraine B. Anderson, et. al. Posttranslational Modifications in the CP43 Subunit of Photosystem II. PNAS 99.23 (12 Nov. 2002): 1467614681. Sept. 2003 _____ and Bridgette A. Barry. Tande m Mass Spectrometric Identification of Spinach Photosystem II Light Harvesting Components. Photosynthesis Research 72 (2003): 159173. Sept. 2003 _____ and Steven W. Wilhelm. Toxic Cyanobacteria: the Evolving Molecular Toolbox. Frontiers in Ecology and the Environment 1.7 (2003): 359366. Pagano, James J. [Environmental Research Center] April 2003 _____ et al. Comparison of Polychlorinated Biphenyl Levels Across Studies of Human Neurodevelopment. Environmental Health Perspectives 111.1 (2003): 6570. See Paul Stewart Sept. 2003 Oct. 2003 _____, Paul Stewart, Susan Fitzgerald, Jacqueline Reihman, Brooks Gump, Edward Lonky, and Thomas Darvill. Prenatal PCB Expsure, the Corpus Callosum, and Response Inhibition. 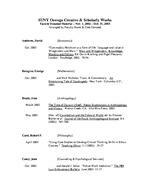 Environm ental Health Perspectives 11.13 (Oct. 2003): 16701677. Oct. 2003 _____, Michael J. Smolen, and Gregory M. Sumner. Congener specific PCB Analysis of Native Foods from Nunivak and St. Lawrence Islands, Alaska. Organohalogen Compounds vol. 62. Dioxin 2003: 23rd International Symposium on Halogenated Environmental Organic Pollutants and Persistent Organic Pollutants (POPS), Boston, Mass., U.S.A., August 2429, 2003. 1724. SUNY Oswego Scholarly & Creative Works Page 9 of 13 Penfield Library, SUNY Oswego 20022003 Reihman, Jacqueline [Psychology] See Paul Stewart Sept. 2003 See James Pagano October 2003 Rosow, Stephen J. [Political Science] April, 2003 Toward an Anti disciplinary Global Studies. International Studies Perspectives 4 (2003): 114. Rule, Audrey [Curriculum & Instruction] Oct. 2003 ______ and M .T. Barrera, III. Using objects to Teach Vocabulary Words with Multiple Meanings. Montessori Life 15.3 (2003): 1417. Oct. 2003 Mystery Cookie Recipes. Mathematics Teaching 183 (2003): 2829. Oct. 2003 ______, K. Young, and S. Fox. Creat ive Investigation of Driftwood Through Evidence, Models, and Explanations. School Science and Mathematics 103.2 (2003): 99109. Oct. 2003 Hands on Problem solving Activities for Place, Value, Money, and Time Dubuque, IA. : Kendall / Hunt Pub., 2003. Oct. 2003 _____ and C. Rust. A Bat is Like a . . Mixing It Up : Integrated, Interdisciplinary, Intriguing Science in the Elementary Classroom: an NSTA Press Journals Collection. Arlington, VA: National Science Teachers Press, 2003. 3239. Oct. 2003 _____, ed. Mathematics in the Real World: How Different Professions Use Mathematics EDRS, ED468389, 2003. Oct. 2003 ______ and L.H. Lord, eds. Activities for Differentiated Instruction Addressing All Levels of Blooms Taxonomy and Ei ght Multiple Intelligences EDRS, ED# pending reproduction, 2003. SUNY Oswego Scholarly & Creative Works Page 10 of 13 Penfield Library, SUNY Oswego 20022003 Rule, William [Physics] Oct. 2003 Modeling of Sleeved Taylor Impact Specimens. Proceedings of ASME Pressure Vessels and Piping Conference, Cleveland, Ohio, July 2024, 2003. n.p. : n.p., [2003.] Shaffer, Barbara [Library] See James Nichols, Oct. 2003 Shockey, Karen [Library] See James Nichols, Oct. 2003 Smith, John Kares [Comm. Studies] April, 2003 Once more unto the Breach, Dear Friends: War in the Persian Gulf as a Rhetorical System. Honor and Loyalty Ed. Leslie D. Feldman and Rosanna Perotti. Westport, CT: Greenwood Pr., 2002. 347359. Smith, Steve [Office of Learning Support] Oct. 2003 Monopoly [poem]. Rattle 8.2 (2002): 74. Spizman, Lawrence [Economics] Oct. 2003 The Economists Role in Equal Pay Legislation. Journal of Legal Economics 11.3 (Winter 20012): 6985. SUNY Oswego Scholarly & Creative Works Page 11 of 13 Penfield Library, SUNY Oswego 20022003 Steiner, Evgeny [Art] April 2003 JapaneseEnglish / English Japanese Dictionary and Phrasebook. N.Y.: Hippocrene Books, 2000. Sept. 2003 Russian, English, Japanese Phrasebook. Moscow: Raduge Pub House, 2003. Stewart, Paul [Psychology ] Oct. 2003 See James Pagano October 2003 Oct. 2003 _________, Jacqueline Reihman, Edward Lonky Thomas Darvill and James Pagano. Cognitive Development in Preschool Children Prenatally Exposed to PCBs and MeHg. Neurotoxicology and Teratology 25 (2003): 1122. Sukrungruang, Ira [Writing Arts, English] Oct. 2003 _____ and Donna Jarrell, Ed. What Are You Looking At? The First Fat Fiction Anthology Orlando, Florida: Harcourt, 2003. Turco, Lewis [English, Emeritus] March 2003 Seasons Downeast [poem]. The Hampden Sydney Poetry Review Winter (2002): 26. March 2003 R.S. Gwynn, Amiri Baraka, Donald Justice, The Poetics of W.D. Snodgrass, and Miller Williams, rpt in Twayne Companion to Contemporary Literature in English from the Editors of the Hollins Critic Ed. R.H.W. Dillard and Amanda Cockrell. 2 vols. New York: Twayne, 2003. March 2003 [three poems] A Sense of Place: Collected Maine Poems Ed. Lillian B. Kennedy et al. n.p. : Bay River Press, 2002. p. 2729. SUNY Oswego Scholarly & Creative Works Page 12 of 13 Penfield Library, SUNY Oswego 20022003 March 2003 Jasper Olson [poem] and Sestina: The End Game. An Exaltation of Forms: Contemporary Poets Celebrate the Diversity of their Art Ed. Annie Finch and Katherine Varnes. Ann Arbor: U. of Mich. Pr. 290296, 312. March 2003 Failed Fathers [poem]. The Penguin Book of Italian American Writing Ed. Regina Barreca. n.p. : Penguin, [2002?] 514. March 2003 The Cherub: Memoir. The Edge City Review 6.1 (2002): 3 + March 2003 Carousel Mall. The Edge City Review 6.1 (2002): 2326. March 2003 Metaphysical Ode: To Love [poem]. The Formalist 13.2 (2002): 923. March 2003 A Medicine for Melancholy [poem]. Pipes and Tobaccos 8.1 (2003): 20. Van Atta, Sydney A. [Political Science] Sept. 2003 Regional Nationalist Parties and New Politics: The Bloque Nacionalista Galego and Plaid Cymru. Regional & Federal Studie s 13.2 (Sum. 2003): 3056. Vanouse, Donald [English] Oct. 2003 Stephen Crane. The Heath Anthology of American Literature. Ed. Paul Lauter. Boston: Houghton Mifflin, 2002 [?]. pp. 1556. Oct. 2003 Stephen Crane in Cuba: From Jingoism to Crit icism. Stephen Crane Studies [no.rol.] (2002): 2331. Whittingham, Georgina [Modern Language & Literature] April 2003 [Rev. of] Light into Shadow: Marginality and Alienation in the Work of Elena Garro by Julie Winkler. Latin American Theatre Review 36.2 (2003): 1867. SUNY Oswego Scholarly & Creative Works Page 13 of 13 Penfield Library, SUNY Oswego 20022003 Wray, K. Brad [Philosophy] Sept. 2003 Is Science Really a Young Mans Game? Social Studies of Science 33.1 (Feb. 2003): 137149. Sept. 2003 Invisible Hands and the Success of Science. Studies in Dialects of Nature 18.11 (2002): 4448. Sept. 2003 [Rev. of] The fate of Knowledge by Helen E. Longino. Philosophy in Review 22.5 (Oct. 2002): 334335. Sept. 2003 [Rev. of] Who Rules Science? An Opinionated Guide to the Wars by James Robert Brown. Philosophy in Revie w 23.2 (April 2003) 8486. Sept. 2003 [Rev. of] Science and Selection: Essays on Biological Evolution and the Philosophy of Science International Studies in the Philosophy of Science 16.2 (2002): 1912. Zakin, Helen J [Art] April 2003 _____ and Virginia C. Raguin. Stained Glass Before 1700 in the Collections of the Midwest States 2 vol. London: Harvey Miller Pub. for Corpus Vitreanum, Inc., 2001. Zakin, Richard [Art] Oct. 2003 A History of the Electric Kiln, and Using the Electric Kiln. The Studio Potter 31.2 (June 2003): 33, 4648.